Although the McLaren-Mercedes MP4-13 was still superior to the Ferrari F300 Michael Schumacher's victories in France and Britain had put McLaren on the defensive. There was heavy rain in the days before the race and on Saturday a shower in qualifying meant that it turned into a scramble and Giancarlo Fisichella was able to take pole position for Benetton with Jean Alesi's Sauber alongside. Mika Hakkinen was third for McLaren with championship rival Michael Schumacher fourth. Fifth and sixth on the grid were Rubens Barrichello's Stewart-Ford and Mika Salo's Arrows while Ferrari's Eddie Irvine was eighth and David Coulthard ended up 14th. Hakkinen and Schumacher made the best starts and passed both the front row men to lead Fisichella while Alesi found himself in fifth behind Barrichello. Pedro Diniz and Mika Salo in the Arrows collided and Coulthard lost a front wing in the melee. A Safety Car was despatched while Coulthard pitted for repairs. The race restarted with Hakkinen battling Schumacher for the lead. On lap 5 the Ferrari driver made a rare mistake and allowed Fisichella to get ahead but Schumacher was soon back behind Hakkinen. 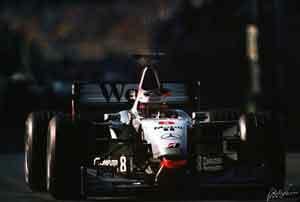 On lap seven the two cars made contact but both stayed on the track and Hakkinen began to pull away. Barrichello disappeared with a mechanical problem while further back Coulthard charged through the field to be seventh by lap 16. On the next lap Schumacher made another mistake and the Ferrari went off bouncing wildly over a sandtrap, tearing off the front wings of the car. He had to pit. While Coulthard found a way past Alesi to take fourth place, Fisichella came into the pits. When he rejoined he found Alesi alongside him and the two ran side-by-side up the hill to the Remus Kurve where they collided and were both out. This left a delighted Coulthard in third place behind Hakkinen and Irvine and when the Ulsterman had to pit again he dropped behind Coulthard. The result was a McLaren 1-2. Michael Schumacher fought back from his delay and was able to catch and pass his brother Ralf, who was running fourth in the Jordan. Irvine then slowed to let Schumacher take third place.